Having your loved one suffer from cancer can be overwhelming. Cancer affects the complete family, not just the person diagnosed with it. “How can I help? What do I do now?” are the common worries of the family members. 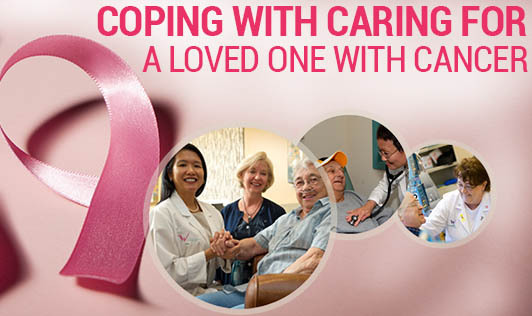 The following are some tips intended to help you serve as a positive and effective caregiver to someone with cancer. Remember that care giving is a team effort : Family members, friends, relatives, doctors all together form the care giving team. So when someone asks, “Is there anything I can do?”- accept the helping hand. Learning to say ‘Yes’ when you require help will ease your anxiety. Recognize a “New Normal” : Maintaining balance between fulfilling duties of a new caregiver and the finishing daily chores in your own life can get difficult. Acknowledge that your home life, finances, and friendships may change for a period of time. Strategize to integrate your new routine with the old one. Identify parts of your life that you can still control, keep some tasks on hold, and add the new day to day chores. Keep away the guilt of not meeting every ones expectations and realize that the support you provide is priceless. Relieve your mind, recharge your body : The task of care giving can easily get overwhelming. Taking small breaks and doing simple activities you enjoy like taking a walk or nap, stretching out, listening to music, doing yoga or simply some deep breathing exercises, will help you rejuvenate and avoid burnout. Allow yourself time to spend with people important to you. This will be beneficial for your health and wellbeing. Be kind to yourself : To be able to care for your loved one, you need to take care of your mental and physical health as well. It’s okay to acknowledge your limits. Eating healthy food, staying hydrated, exercising, and getting enough sleep will keep your health on track. Prayer, meditation, and other spiritual activities have also shown to calm and refresh the mind. Seek professional help if you’re finding it difficult to cope with your mental or physical health. Plan Ahead : Though planning ahead can be difficult because caregivers are often troubled by feelings of uncertainty, making plans for the future (both short term and long term) have been shown to help. Scheduling activities on days your loved one is not feeling the side effects of treatment will be something to look forward to for both of you. Having the paperwork ready such as healthcare agent, power of attorney, and a will can also prove beneficial.